According to the Nepal Mountaineering Association’s classification, Climbing peaks are the peaks that have an altitude in the range of 5000 to 7000 meters. Peak climbing is a technical climb and demands special skill and gears depending on the peak. However, peak climbing is less challenging and easier than the mountain expeditions. Climbing Peaks are the practice peaks before the actual mountain expeditions. The real mountain expedition demands the experienced skills on technical climbs and use of climbing gears. So, to gain experience for the actual mountain expedition, climbing peaks climbing is the preparatory climb. Nepal opens around 326 peaks for the climbing. You can attempt climbing in various parts of Nepal depending on the geography. Among three hundreds of climbable trekking peaks, here’s a list of 10 popular climbing peaks in Nepal. The peak is also called as Imja Tse. Island Peak is a common choice among the summiters before they attempt Mt. Everest. This is not a really challenging peak, however, at some points, you need to walk across the crevasses and ascend the steep slopes. During such points, you will notice the challenge of this peak climbing. The peak towers above the Chhukung valley. The peak is between Mt. Ama Dablam and Mt. Lhotse. On this trip, you will get a chance to explore Chhukung glacier as well. From the peak, you will get amazing views of Nuptse, Lhotse, Makalu, Baruntse, and Amadablam. Mera Peak is the highest climbing peaks in Nepal. But it is less challenging than Island peak climbing. Mera Peak has three peaks- Mera North, Mera Central, and Mera South. 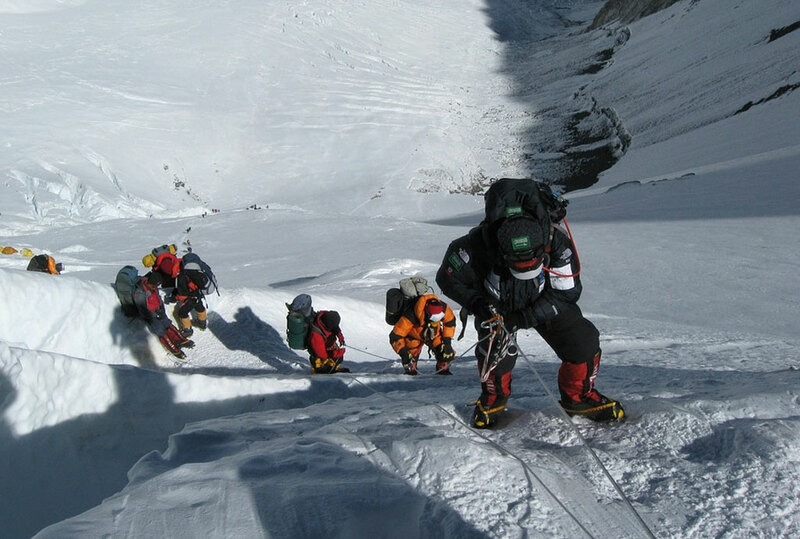 Mera Peak climbing refers to ascending to Mera Central n the Everest region. The peak has less difficult slopes and steep climbs so you will have lesser difficulty while attempting this peak’s summit. So, you can walk easily most of the time, but during the final ascent to the summit, you need to cross a steep slope which is challenging. During this time, you need to use your climbing gears like the harness, ice ax, crampons. Lobuche peak rests on the Everest region towering above the Lobuche village. Lobuche peak has two peaks – Lobuche east and Lobuche west. Lobuche Peak climbing refers to Lobuche East peak. Lobuche West is technically demanding than the Eastern peak. Lobuche East is also the challenging peak (PD+) and it demands prior climbing experiences. On this climb, you will walk across the stone terraces and snow-covered slopes which could add difficulty to this climb. Before your actual ascend to the summit you need to traverse through the 45-degree slopes and sharp descents. Such condition asks for your climbing skills and climbing gears as well. It is a popular climbing peak in the Langtang region. It is a low-altitude, quite easy and non-technical climbing peak. From the peak, you will have an amazing view of Shishapangma, the highest mountain in Tibet. The base camp of the Yala peak is an alpine meadow for Yak-grazing. But as you ascend higher from the base camp, you will have to first climb a difficult southern face of the peak and walk through Yala Glacier. On this climb, you will have to walk past the rocky ridges with multiple descends before you reach the actual peak. With a fit body, anyone can opt for this peak climbing. The peak has PD trekking grade so it is not a technically challenging peak. However, the knowledge on the fixing ropes and rock climbing are demanded. It is situated on Manag valley on the eastern part of Annapurna ranges. The summit offers the stunning views of Annapurna ranges, Manaslu ranges, Gangapurna, and Trans-Himalayan Tibetan plateau on the northern side. You can join this peak climbing as a side trip to the Annapurna Circuit trek. The peak appears like a pyramid rising above the Pisang village. As you ascend from the high camp you will have to walk across the sloppy ridges but walking slowly and proceeding gradually it is not much challenging. Dhampus Peak is also called Thapa Peak. This is a PD (little difficult) grade climbing peak in the Annapurna region located north-east of the Dhaulagiri ranges. So, many trekkers plan this peak climbing as a side-trip to Dhaulagiri Circuit trek. On ascending towards the Dhampus peak you will walk through French Pass, 5360 meters and Dhampus Pass, 5420 meters. Because the peak is less challenging anyone can do this trek without the need for special climbing gears and climbing skills. But you should do enough acclimatization to overcome the peak climbing successfully. From the peak, you will get to enjoy the alluring views of more than 30 different peaks and the closer views of Tukuche and Dhaulagiri range. In the local language, it is called as Tharpu Chuli which rests on the south of Annapurna Base Camp. This climbing peak has a difficulty grade of alpine PD grade. So, the climb is technically challenging but it is least challenging than other climbing peaks in the Everest region. On this climb, you need to walk across several ridges and steep slopes. So, you need to have proper skill on the use of ice ax, crampons, and knowledge of rope fixing. So, this climbing peak could be more challenging for the inexperienced or first-time climbers. This climb gives you a chance to walk across the glacial lakes on the lap of Annapurna range. Due to the lower altitude than other climbing peaks, many trekkers opt for this climb. From the summit of the Tent Peak, you will get a panoramic view of Annapurna I, Annapurna South and Annapurna III. You can do this climbing along with the combined trek to Annapurna Base Camp and Machhapuchhre Base Camp. Chulu West is one of the enticing peaks in the Annapurna region. Chulu Peak has two peaks – Chulu East and Chulu East on the neighborhood of Thorong La Pass. In the Chulu West peak climbing, you will catch the stunning views of Annapurna ranges, Nilgiri, Dhaulagiri ranges, and other peaks in the Annapurna region. This is a strenuous grade climbing peak which demands your physical strength along with the technical climbing skills. For this peak climbing, you need to be well-trained on the use of ice ax, crampons, fixing ropes and so on. You have to walk across several challenging slopes and steep rocks. The peak is bordered by Chako and Phu Khola on the east while Marshyangdi river and Mesokanta Pass on the south. This peak climbing can be a great alternative to the crowded trekking peaks in the Everest region. On this climbing tour, you will follow the trails of Annapurna Circuit and then start off for the peak. On the way, you will explore the diverse vegetation and landscape of the Annapurna region. Although NMA has listed it as a group B climbing peak, Pokalde Peak is among quite easy climbing peak in the Everest region. This peak does not demand any technical climbing skills. You can ascend to the summit of this peak even without the use of Ice Axe and Crampons. The peak lies on the south of Kongma La Pass on the way to Chhukung valley. Once at the peak, you will get an amazing view of Mt. Everest, Mt. Nuptse, Ama Dablam, Mt. Lhotse, and several other giant massifs in the Everest region. From the Pokalde Base Camp, an easy ascend of 650 meters and you will be on the summit of Pokalde peak. But the peak contains the section of loose rocks, so you should be very careful as you make a climb. This peak can be a great option for peak climbing for the novice and amateur trekkers. This amazing peak rests on the southern side of Tashu Lapcha Pass. And Rolwaling valley is the entry point to this peak climbing which is on the west of Khumbu region. However, the trail is quite challenging from the Rolwaling valley so climbers start off for their climb from Namche Bazaar or Thame village. This is a strenuous grade climbing peak but in some section, you have to walk across the sloppy crevasses and the ice segments. The real challenge of the climb actually lies in crossing those crevasses. Once you climb the peak, you will get the amazing views of Mt. Gauri Shankar, Everest, Makalu and other peaks of the Langtang region and Everest region. This is one of the least attempted peaks, so you will have amazing time climbing this peak in the least crowded surrounding. On this climb, you will explore the Drolambu glacier which stretches to the summit.